Give your home living room a charming accent with this country style wide-seat armchair. 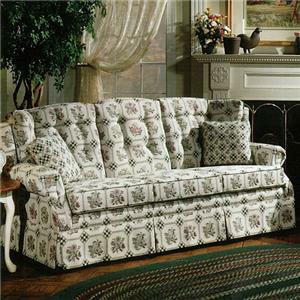 A kick skirted base is coupled with low rolled arms and a button tufted seat back for a pleasant blend of traditional and cottage styles. The seat cushion features high density foam padding and a Comfort Coil spring mechanism. Select from multiple fabrics for an upholstery type that suits your individual taste. The 840 Country Style Upholstered Armchair by Lancer at Wayside Furniture in the Akron, Cleveland, Canton, Medina, Youngstown, Ohio area. Product availability may vary. Contact us for the most current availability on this product. Browse other items in the 840 collection from Wayside Furniture in the Akron, Cleveland, Canton, Medina, Youngstown, Ohio area.